HTML5 viewers display domain values in all contexts. To search for features with a particular domain value, users search on the value, not the code. You cannot display or search on codes in an HTML5 viewer. Reports have built-in support for coded value domains. You do not need to configure the Geocortex Services Enhancement Proxy to show domain values in reports. Code: To show a field's code in the component, type the ArcGIS Server field name in the DataField box. Value: To show the field's value in the component, type the ArcGIS Server field name in the DataField box and append .name() to the field name. You want to show the values (Fire, Medical, Police) in the report. You drag a TextBox component from the Controls panel ( in the screen capture below) to the design surface ( ) and type CallType.name() in the text box's DataField box ( ). 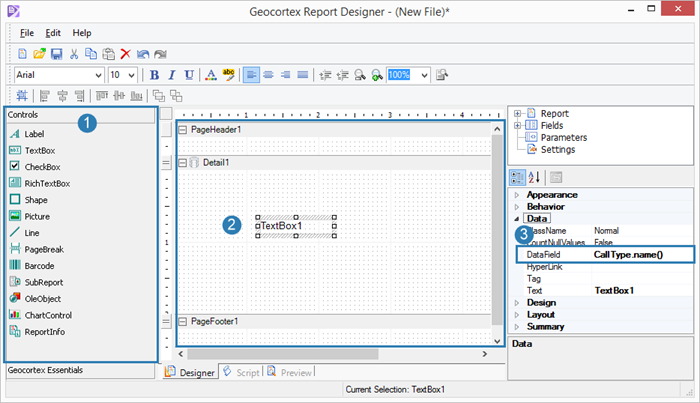 You can configure a report template to show only values, only codes, or both values and codes. To also show the code, you would drag another text box to the design surface and type CallType in the DataField box.